I chose these purely by name. Snickers and peanut butter ... it seemed to me like an insane, great idea. And after trying them I still agree! Nigella Lawson filed these muffins in the 'Children' chapter of her book 'How To Be A Domestic Goddess'. I can totally see why; kids love anything that has a chocolate bar in it, and the fusion of Snickers and peanut butter is something that only kids can fully appreciate. They certainly make for an interesting breakfast. Not a sweet, but a salty breakfast. And today I was lusting after a salty breakfast. Mission accomplished! Rating 3.5 out of 5. - Stir together the flour, sugar, baking powder and salt. 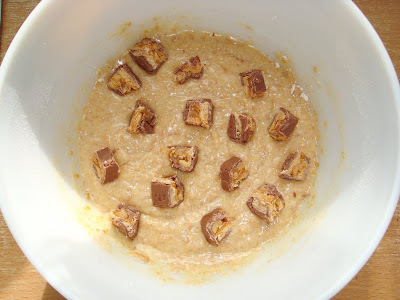 Add the peanut butter and mix until you have a bowl of coarse crumbs. Add the melted butter and egg to the milk and then stir this gently into the bowl. 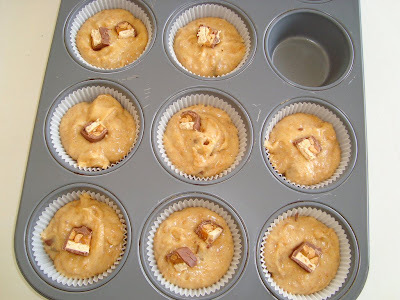 Mix in the Snickers pieces and dollup into the muffin cups. 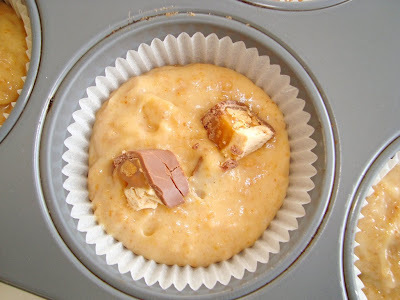 The Snickers pieces in the peanut butter batter. What I love about making muffins is that it's never fussy. You don't even have to get out you mixer; you just mix everything together - smoothly - with a fork. 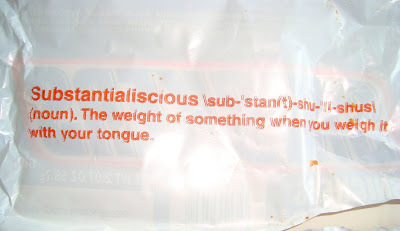 A dictionary lesson from Snickers & co. I halved the recipe and got 8 muffins out of the batter. 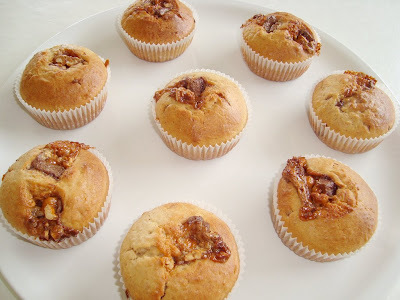 I kept a few Snickers chuncks back and and placed them on top of the batter in the muffin cups. You are such the busy bee. These look amazing. These look really fun!I'm so baaadly craving snickers right now!! 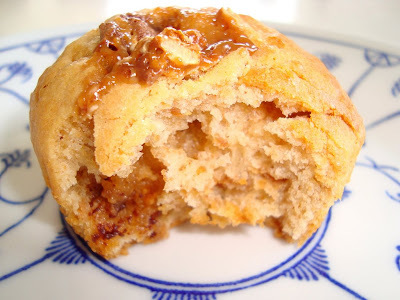 snickers in a muffin? at breakfast? i have to see this cookbook! Oh droooool! They look delicious!